Not often we come across technologies that are so disruptive that they turn industries upside down. Docker container is one such technology that’s literally transforming the IT world. Docker founder and Chief Technology Officer Solomon Hykes is one of the few technology leaders who thoroughly understands the open source development model and the sauce that’s needed to turn into a profitable business. Hykes may not sound very French, but he grew up in France. His parents moved there when he was very young. Hykes began programming as a teenager. Throughout most of high school, he skipped classes to work on programming jobs at the local cyber café. Eventually, he went to a programming school for software engineering training. As expected, open source became part of Hykes’ environment as well. He was an active participant in open-source and it remained an instrumental element of the companies he formed and technologies he created. DockerCon 2017 Opening Session. Docker Founder Solomon Hykes. Photo by Alabastro Photography. He believes that the open-source community traditionally has been a home for that kind of approach. It’s always been attractive for builders to work in an environment where there’s a direct feedback loop. “It’s you, your code and either it works or it doesn’t. Either people adopt it or not. There’s less layers of indirection and ambiguity. I think that’s attractive to a lot of open-source contributors. We’re trying to follow that philosophy,” said Hykes. What’s unique about Hykes is that he has a very good mix of a technologist and an entrepreneur. Docker is one of those rare examples of a fine balance between open source and business. There are very few companies that manage to strike that balance and Hykes cultivated Docker into one such company.“Our approach from the beginning has been unconventional because we were very deliberate. This is a strong opinion that I have, that you can’t separate open-source and business,” he said. He believes that open source projects and products are two faces of the same coin. “If you only do open-source projects, then you’re doing technology for the sake of technology. If you only do products and you don’t have an open-source collaboration in the background, then you’re not going to be able to solve as many problems because you won’t have access to as much technology,” said Hykes. His approach was to combine the two. 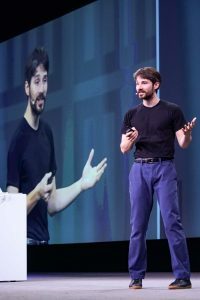 He defied the conventional wisdom of what he calls Open Source 1.0, where the dogma tells us there has to be a big, bright red line between community and the product. On one side, there has to be the selfless community that does everything for free and doesn’t care about money and on the other side are the evil corporations. He believes that society as a whole does not benefit from open-source as charity. “I think, society benefits most if anyone participating in open-source can also be an entrepreneur and seek to benefit from their own work and find sources of funding for their own work,” he said. The market was ripe for the technology and company like Docker. Hykes’ right approach towards open source and business turned it into a success. Originally, Hykes, along with some coworkers, created the Docker container technology as an internal tool for the dotCloud platform services company. In 2013, the company open sourced the technology under the Docker nameplate. The rest is history. Another factor that contributed to the success of Docker was building a product and platform that was easy for anyone who wanted to program or create things with software could, not just the elites or systems experts. Hykes worked really hard to make things simpler. “Making things simple is hard. Our reward was a much larger pool of people that can use and benefit from Docker,” he said. That once again defied the conventional wisdom of most open source technologies that tend to be very hard to use. Being a sysadmin of a Linux server is not a job for the faint of heart. Hykes also recognizes one serious problem with the old school open source world that’s often neglected. Open Source 1.0 is a close club. “It’s about a small club of people and you have to earn your way in. In a lot of ways, it’s not welcoming at all,” he said. He has met and spoken to a lot of people who were really excited about getting into programming, inventing new things, discovering open-source. “They all had an experience of being rejected or turned back from open-source projects that they tried to participate in. These projects are not designed to welcome newcomers or lower the bar,” said Hykes. You often hear that containers have always been around. Linux always had containers. True, but no one saw the potential that Hykes saw. That said, Linux didn’t support all those features that you see today in Docker containers. He started using container technology to build interesting things and solve interesting problems. “That’s where my involvement started with containers. Later when Linux developed proper container support, that helped accelerate the work,” said Hykes. But since he has already been working on containers, he was way ahead of the curve. That established Docker as the pioneer of container technologies. Back in those days, the problem he was trying to solve with containers was of building applications and running applications in a new environment. That environment was not just one computer but many computers interconnected into a cluster. Dealing with distributed systems was a big problem back then. Hykes wanted not just the experts but any programmer to be able to use it. Today, Docker is a phenomenon where companies like Google are releasing technologies that they use internally to help companies consume containers, Microsoft is transforming its own platform to be able to consumer containers. “I started out in France because that’s the market I knew the most. I had clients I could work with. I had friends and colleagues that I could recruit, so I started DotCloud in France.” he said. But as his company started to grow, Hykes started looking for funding to scale the company. He found that funding in the U.S. and decided to relocate to the San Francisco Bay area in late 2010. Docker has evolved from a small project that started in France to a global phenomenon that has led to the creation of a microeconomy where there is an entire industry to help companies consume containers. Docker today has hundreds of developers as employees and it continues to hire and grow. So what kind of day-to-day involvement does Hykes have at the company? 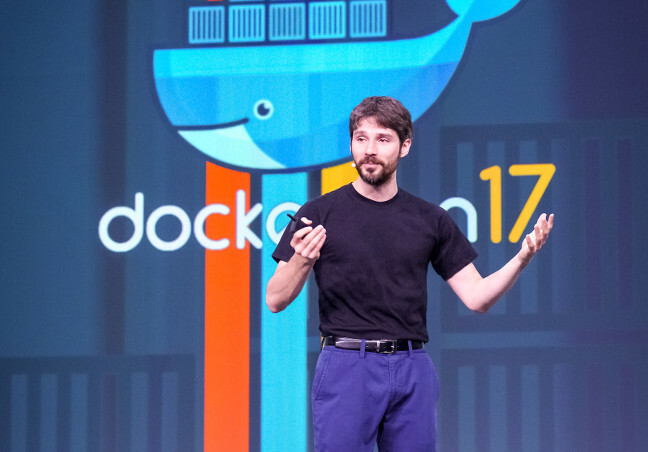 Docker started out as a single project but now it’s a constellation of many different projects, including containerD, LinuxKit, SwarmKit, and the Moby Project. Each has a very specific scope but yet can integrate into a bigger platform. Hykes deployed the traditional open source approach at Docker to all these projects. These days he is trying to be one step removed and is trying to contribute indirectly rather than directly. His focus is on ensuring that important problems that their customers face are addressed. He wants to ensure that interesting ideas, talented and motivated contributors get the attention and support that they need. “I think of myself more as an enabler; more of a coach than a player. It’s pretty fun, actually,” he said.